I have on several occasions in the past mentioned that C.S. 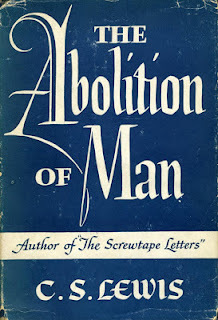 Lewis’s short and elegant book on moral philosophy, The Abolition of Man, could be read as a preface to Leo Strauss’s much more dense Natural Right and History, and further wondered whether these roughly contemporary thinkers were ever aware of one another, despite being in different academic disciplines and in different countries. May I mention one point? We don’t have time to read it here: there is a book, or rather a series of lectures by C.S. Lewis, the English author, The Abolition of Man, which is worth reading from every point of view. It is his criticism of social science positivism.... And he calls these men here, in the first lecture, “men without chests,” meaning they admit bodily desires, and they admit reasoning, in a way: namely, how to get the objects of bodily desires. The other things, the values, as they are called, are merely subjective. In other words, there is a lower part of the body, stomach and below, and there is a brain; but there is nothing in between. There is no heart. This is not a bad description of this view of man. I recommend it to your reading. C.S. Lewis, The Abolition of Man, New York, 1959. The original publication of the book was in 1943.